ADHÉMAR, dit Saint-Martin, TOUSSAINT-ANTOINE (often referred to as Anthony or Martin Adhémar but he usually signed Adhemar St Martin), fur trader and office holder; b. 9 Sept. 1740 in Montreal (Que. ), youngest of three children of Jean-Baptiste Adhémar* and Catherine Moreau; brother of Jean-Baptiste-Amable*; d. 22 Nov. 1804 in Michilimackinac (Mackinac Island, Mich.). Toussaint-Antoine Adhémar, dit Saint-Martin, was the son and grandson of royal notaries, and may himself have trained as a physician. He married Geneviève Blondeau at Montreal on 17 Oct. 1768, and shortly after their marriage he and his wife moved to Detroit (Mich.), where he entered the fur trade. For some 30 years he traded and travelled extensively throughout the hinterland south and west of the Upper Lakes, but his trading ventures were generally unrewarding and he fell deeply into debt. In 1775 he was the “principal sufferer” when British forces destroyed a cargo of trade goods from the Chippewa, wrecked on Presque Isle, Pa, to keep it from falling into American hands. Adhémar petitioned for compensation, noting that his loss of £400 was “of great consequence” as he was “burdened with a numerous family” and had large debts. 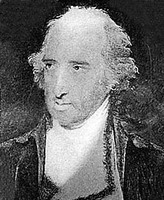 In supporting his claim Henry Hamilton*, lieutenant governor at Detroit, wrote to Governor Haldimand that “while the Traders on every side [were] enriching themselves” at the expense of the government, Adhémar had often supplied military stores at prices below prevailing market value. Such practices did not relieve Adhémar’s mounting debts, but they did enhance his reputation among British officials. In 1778 he was appointed commissary for the contingent of Indians and militia accompanying Hamilton’s march on Vincennes (Ind.). On 5 March 1779, unaware that Hamilton had surrendered to Colonel George Rogers Clark, Adhémar was captured while ferrying supplies and reinforcements to Vincennes. A few days later Adhémar and the other members of the Detroit militia were released once they had taken an oath of neutrality. 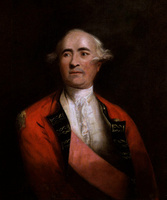 Adhémar nevertheless retained his allegiance to the crown: in 1780 Augustin Mottin de La Balme, during his abortive raid on Detroit, referred to Adhémar as a “dangerous man,” deeply committed to the British cause. After the war Adhémar joined the newly organized Miamis Company, a small union of Detroit merchants, and in 1786 he was sent as its agent to the Miamis Towns (Fort Wayne, Ind. ), several Indian villages on the portage between the Miamis (Maumee) and Wabash rivers. Adhémar’s fortunes continued to decline, however. In September 1787 he relinquished his house in Detroit to William Macomb in payment of debts, and he signed over personal property and outstanding debts to John Askin. Adhémar’s obligation to Askin was not finally resolved until 1802. Some of Adhémar’s problems were not unique to him. During the 1780s British control of the fur trade south of the Upper Lakes was threatened by the expansion of the American frontier. Although Britain had agreed in the peace treaty of 1783 to withdraw its forces from the region, British troops remained in possession of the western forts and encouraged the Indians’ political and diplomatic efforts against American encroachment on their lands [see Thayendanegea]. The resultant warfare focused on the strategic Miamis – Wabash portage as the Americans attempted to drive out the British traders and break the Indians’ confederacy. 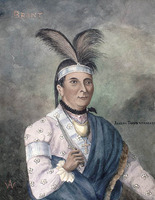 Although attacks by Brigadier-General Josiah Harmar in the fall of 1790 and Major-General Arthur St Clair a year later were repulsed by the confederacy’s forces under Little Turtle [Michikinakoua], considerable damage was inflicted on the traders’ warehouses and the Indians’ villages. These attacks, coupled with the demise of the Miamis Company by 1789, took Adhémar back to Detroit. Adhémar’s lack of success in business contrasted sharply with his career as a public official. Continuing in the militia as a lieutenant, he was nominated justice of the peace at Detroit in 1788, but later resigned since the local merchants protested the appointment of a merchant to such a post. In 1789 he was placed on the land board of the District of Hesse. Adhémar attended meetings of the board only through March 1791, although he was listed as a member for several years afterwards. By 1792 at the latest Adhémar had moved to Michilimackinac, where he served as justice of the peace and notary (the former notary, Jean-Louis Besnard*, dit Carignant, having died unexpectedly in 1791). Of his eight children at least three became active in local affairs at Michilimackinac. Adhémar remained there after the British evacuation in 1796, and in that year he was named justice of the peace and notary by acting American governor Winthrop Sargent. He retained those positions until his death in 1804. ANQ-M, CE1-51, 10 sept. 1740, 17 oct. 1768. “Board of land office, District of Hesse,” AO Report, 1905: 1–268. [Henry Hay], “A narrative of life on the old frontier: Henry Hay’s journal from Detroit to the [Miamis] River,” ed. M. M. Quaife, Wis., State Hist. Soc., Proc. (Madison), 1914: 208–61. Henry Hamilton and George Rogers Clark in the American revolution, with the unpublished journal of Lieut. Gov. Henry Hamilton, ed. J. D. Barnhart (Crawfordsville, Ind., 1951). John Askin papers (Quaife). Mich. Pioneer Coll., 9 (1886): 467, 494, 505; 19 (1891): 319, 586. Wis., State Hist. Soc., Coll., 14 (1898): 20; 19 (1910): 98, 159. H. P. Beers, The French & British in the old northwest: a bibliographical guide to archive and manuscript sources (Detroit, 1964). The city of Detroit, Michigan, 1701–1922, ed. C. M. Burton et al. (5v., Detroit and Chicago, 1922). Christian Denissen, Genealogy of the French families of the Detroit River region, 1701–1911, ed. H. F. Powell (2v., Detroit, 1976). Neatby, Quebec. W. W. Potter, “The Michigan judiciary,” Mich. Hist. Magazine (Lansing), 27 (1943): 418–33. David R. Farrell, “ADHÉMAR, Saint-Martin, TOUSSAINT-ANTOINE,” in Dictionary of Canadian Biography, vol. 5, University of Toronto/Université Laval, 2003–, accessed April 24, 2019, http://www.biographi.ca/en/bio/adhemar_toussaint_antoine_5E.html.